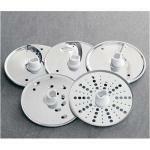 They are very common appliances in kitchen households today. But 50 years ago, food processors didn’t even exist. We’ve come a long way since then. 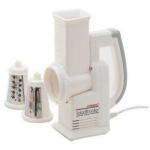 The first food processor was invented by Pierre Verdun, a French caterer and small business owner. With all the prep work required of him and his cooking staff, he thought of ways to make it less time-consuming. He created a bowl with a rotating blade inside at the base. Eventually, this concept grew into the first commercial food processor, which was made by Robot-Coupe. In 1960, it was available exclusively to catering kitchens. Over the years, the designs became smaller and cheaper to manufacture, leading to the debut of the Magimix Food Processor in the early ’70s. 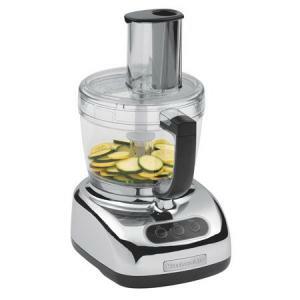 Today, just about every major kitchen appliance brand has their own food processor model to choose from: Cuisinart, KitchenAid, and Hamilton Beach among many others. 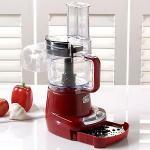 Food processors these days aren’t limited to chopping veggies in a flash. Depending on the model you get, they can come with dozens of interchangeable parts and blades. You can knead dough, shred cheese, chop fresh herbs, mince garlic, and blend ingredients together for a sauce or dip. Know what kinds of attachments are out there, think about the types of cooking you do most often, then shop for a food processor that’ll make those tasks easier. For example, you won’t need to spend extra cash for a dough blade if you won’t be making homemade bread that often. Size matters, too. Or, in this case, size can be deceptive. If you plan to process a lot of liquids, then you’ll only be able to fill up an 8-cup bowl with 4 cups of liquid. That’s because most food processors have an open hole in the center for fitting the blade. Add too much liquid, and it’ll pour inside the hole, possibly damaging the motor. So you’ll generally want to get the largest capacity bowl that you can afford. It’s a bonus if you can find a food processor with both a large and small interchangeable bowl. Above all, the most important thing to consider is: durability. How strong is the motor? Does it come with a lengthy warranty? Attachments don’t mean jack squat if the food processor is not strong enough to do what you want it to do. And don’t worry about finding a model that has 5 or more different speeds. As long as there’s a pulse option, any fast speed will do. One of the best food processors that we’ve seen so far is the KitchenAid KFP750, voted best by Consumer Reports due to its powerful 700-watt motor and 12-cup capacity. Plus, it comes with a highly-sought-after mini chopper to tackle herbs, garlic, and other small blends that wouldn’t be possible in a 12-cup bowl. 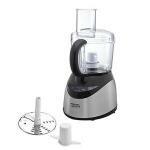 Some food processors are catered to a specific use, like the Presto Salad Shooter. 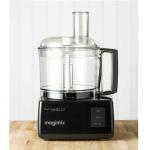 It processes veggies, cheese, and other ingredients on the spot with no bowl to clean up. Other food processors come as attachments to stand mixers — and if you already own a stand mixer, this will likely be your best bet. Stand mixer motors are stronger than anything you’ll find otherwise. If you happen to be looking for a blender as well, or are wondering which to get, many manufacturers sell “duet” sets that include both food processor and blender with a common base. Which brings to mind an answer for the question at the back of your mind: Yes, it’s extremely important that both of these appliances are used properly. A blender works best when it has liquid at its base to help move things around. A food processor, however, can work with dry ingredients just as well as liquid ingredients, due to the types of blades it can support. Take a peek at this SmartPower duet set from Cuisinart, for example. 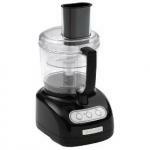 Built for slicing, shredding, mixing dough, and blending, the all purpose ten-cup Black and Decker FP 1550S Food Processor can perform well but requires some special care. The ten-cup capacity is misleading, with amounts well below this level being a safe amount for this lightly built machine. This Wave Action 12 Speed Blender/Food Processor from Hamilton Beach has been designed around special features that somewhat limit its all around effectiveness. It can still be a good choice if you like what it does best--milk shakes and smoothies. The Back to Basics Strainer is better than a Foley mill, better than old fashioned methods for processing produce. The mill mounts on the table or counter. It has a hand crank operation, but don't be fooled; this device is FAST. It seems every appliance manufacturer tries to outdo the other with their offering. Sometimes it's more power or features and often it's more competitively priced. Cuisinart, the originator of the modern food processor, has so many different models of the same machine available today, they need someone in marketing to just say "enough already!" Currently there are more than twelve varieties available on their website. This is the latest incarnation of the flagship food processor from Cuisinart. No streamlined euro-looks, no sophisticated controls, just a beefy food processing machine, now wearing a new suit of brushed stainless steel. 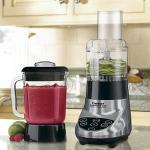 The Cuisinart SmartPower Duet five hundred watt blender gives you all the power you'll need to shred, slice, mix, chop, and liquefy. It also doubles as a three cup food processor. Crush ice at the touch of a button. Pulse at any speed with one simple touch. If nothing else, the Cuisinart PowerBlend Duet Blender and Food Processor looks sharp. Its chrome base sparkles. How long that polished chrome will shine depends entirely on how often you use the machine, And, of course, how often you wipe clean the chrome base and its easy-to-use LED indicator. This combo blender/food processor may be the ideal candidate for anyone who values versatility over volume in their food processing needs. Here is a useful addition to the kitchen arsenal, excellent when you need to prepare substantial quantities of chopped, sliced or shredded products for your recipes.